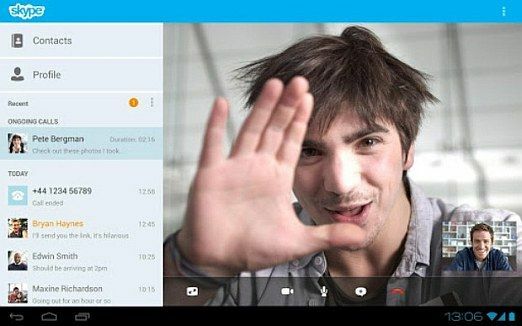 Microsoft-owned Skype has released the version 3.0 of the popular messaging and voice calling application. This update is specifically for Android tablets, and features a revamped interface. Also a part of this update is the added ability to sign in with a Microsoft account. “With so many now using tablets to make video and voice calls with Skype, this latest version is optimized to scale to your tablet's bigger screen, so you can experience Skype on a larger display wherever you go”, said Derek Snyder, head of mobile product marketing at Skype, in a blog post. “And with our redesigned look and feel, Skype looks great no matter what screen size you have - either on a smaller Android phone or the more spacious display of your tablet”, he continued. Skype has also introduced the SILK wideband audio codec that is “designed to capture the richness of human speech”, but more critically, will be able to detect any fluctuations in the Internet connection speed and prevent audio dropouts and loss in quality. The ability to sign in and link your Microsoft account with Skype was expected, ever since the service got merged with Windows Live Messenger, which is retiring soon. The latest version of Skype is available for download via Google Play Store. We would like to hear from you about what you feel is good and bad in the latest update, and what features you expect in the future.